In this video, at 2:12, the Soldano SLO that John Mayer is using in this performance with Ed Sheeran can be seen. 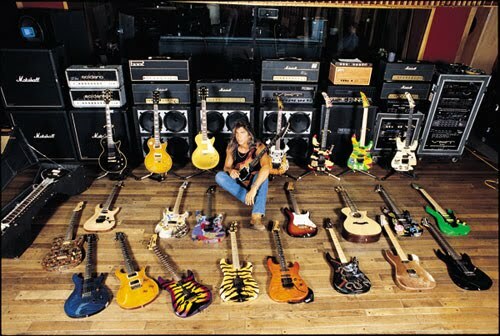 In this photo, Eddie Van Halen can be seen in front of two Soldano SLO 100s. As told in his interview to Vintage Guitar. Seen at 2:25 used mainly in the early 90's. Mark is widely known for his use of the Soldano SLO 100, even though he has been using boutique amps recently his go to amp for live situations still appears to be the SLO 100. It is reported that Clapton started using the SLO due to playing Mark's. At 1:01 of this "Rig Rundown" with *Premier Guitar*, Brian Farmer, Warren Haynes' guitar tech, says "And underneath it, we've got his main Soldano. We use it a lot with the Allman Brothers, and all the time here as well. And that Soldano will go into this as well (pointing to the [Marshall 4x12 Cab](http://equipboard.com/items/marshall-4x12-cab-with-v30-speakers))." In December 2013, George Lynch posted [this](http://georgelynch.com/wordpress/george-lynch-searching-for-stolen-wicked-sensation-era-soldano-slo-head/) on his website : "Hey everyone. Happy holidays. George needs your help to recover a Soldano head that was stolen in 1993. The head missing is the gray one (not snakeskin) on the bottom in this photo. The manifest serial number is 88051. This is the amp used for the Wicked Sensation sessions and is the best sounding Soldano George has ever used in his own words. If anyone has any details on this amp, please email us at george@dangerousguitar.com thank you!" when prince was auto-named "the artist"
Ben uses this amp in studio for the new record. 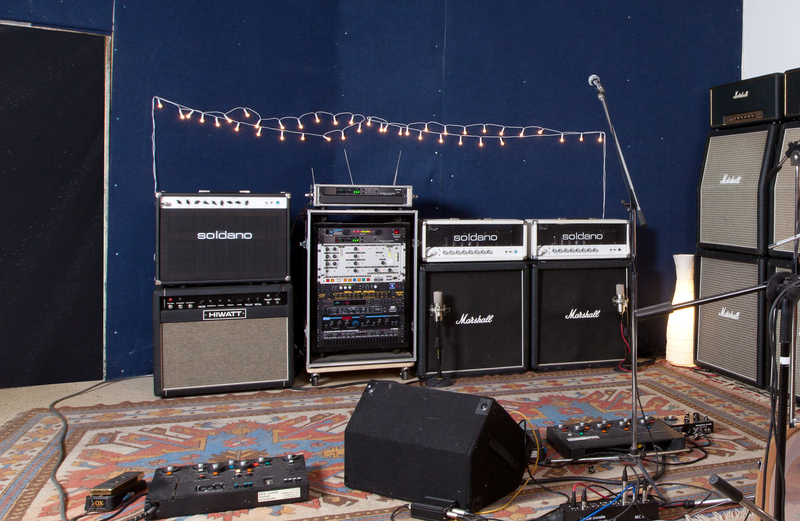 In this interview, Baksh said when he was aked about his guitar rig, "I'm currently using a Soldano because I think it's the best 6L6-powered amp you can buy. It's a SLO100"
"My rig, stage left, 7/3/12, Wallingford, CT" Used mainly with Adelitas Way. As his main amps, German guitarist and singer Marc Dorendorf uses a pair of white Soldano SLO 100 100-Watt Tube Guitar Amplifiers. Jun has tweeeted that he uses this amp and has posted a picture of it. The SLO-100 amp features (2) channels; clean (w/ or w/out crunch) + Lead channel. This amp rocks! It easily cuts through during band performances and also has an effects loop. It came in different tolex coverings including a nice gray snakeskin, which is what I had... pretty cool amp and great sound! A Must have for 90's van halen fans. I have always liked EVH's tone during the For Unlawful Carnal Knowledge and Balance albums and so I I've wanted to get the same sound but use it in my band. I love it.